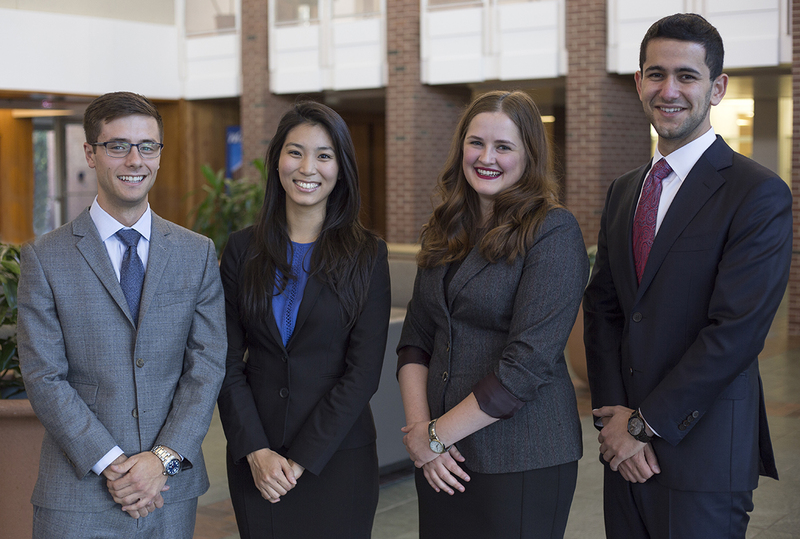 Congratulations to University of Illinois College of Law Trial Team members Al Hassani ’19, Britta Johnson ’19, Miriam Lee ’19 and Tanner Long ’19, who competed in the Florida National Trial Advocacy Tournament (FNTAT) hosted by the University of Florida Levin College of Law. This year, the team argued a challenging case involving a charge of Driving Under the Influence Manslaughter when the defendant was driving an autonomous "self-driving" vehicle. Competing in a field of 12 law schools from across the nation, the team advanced to the quarterfinal round, demonstrating excellent teamwork and professionalism throughout the event. Bridget Schott, an Assistant State’s Attorney in Champaign, served as the dedicated coach for the FNTAT team. Professor Catherine Stahl (Director of the College’s Trial Advocacy Program), J. Andrew Langan (Partner, Kirkland & Ellis Chicago), Ryan Yagoda (Co-founder, Sukhman|Yagoda), Professor Eric Johnson (Associate Dean for Academic Affairs), Miranda Soucie ’10 (Partner, Spiros Law), Will Lynch ’17 (Assistant State’s Attorney), and Dominique Ritvo ’18 provided additional assistance.